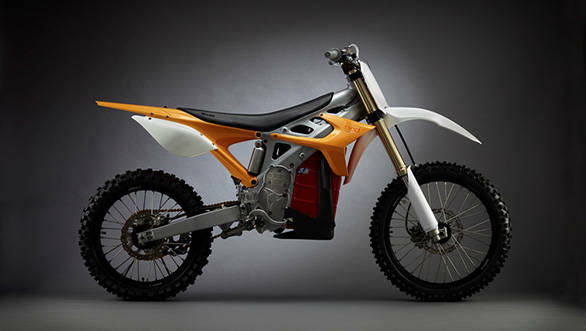 Defense Advanced Research Projects Agency (DARPA), responsible for the development of new technologies for use by the military is on track to build a hybrid motorcycle in partnership with BRD Motorcycles in California and Logos Technologies in Virginia. The bike will be used by the American Military's Special-Ops division. The bike is based on BRD's Red Shift MX  an all electric motorcycle which BRD describes as a barely-street-legal motor-cross racer. The bike weighs 113 kilograms and has a liquid cooled electric motor which pumps out 25PS and also has an extra 15PS for 10 second bursts of power, which takes it up to a top speed of 113kmph. Logos will be designing a new powerplant for the DARPA concept, which means it will probably end up being even quicker. Even the bike's proposed multi-fuel internal combustion engine has an interesting origin, "Its part of a hybrid system for a UAV (unmanned aerial vehicle) that we're currently developing for a customer", says Wade Pulliam, Manager of Advanced Concepts at Logos Technologies. Now, the advantages of having a fast and agile all-terrain vehicle are obvious to everyone, but the real gains come in when there is hybrid power-plant to play with. The maximised range and not to mention near-silent operation will help during stealth missions. The bike's power-plant will also be able to function as a mobile generator which can supply power to soldiers in remote areas. Since it uses a hybrid motor, during low-speed situations, to prevent the petrol engine from stalling, the rider can use the electric motor and go about his business undeterred. Another innovation is the unique two wheel drive system which BRD themselves are working on, it's a complex design brief, but has promised that the bike will be both as light and affordable as possible. "We are certain to learn quite a bit about the potential for both of the core technologies and how they're applicable in the consumer space, and we're certainly going to learn a lot about military requirements for being rugged. I have no doubt that that knowledge will benefit our eventual consumer offerings" says Fenigstein.